Throughout the Bible, God asks questions that alter how men and women saw the world and themselves. These 10 Lifebuilder sessions are based around those questions. As we consider the questions that God asked others, we are guided to reflect on similar questions in our own lives. 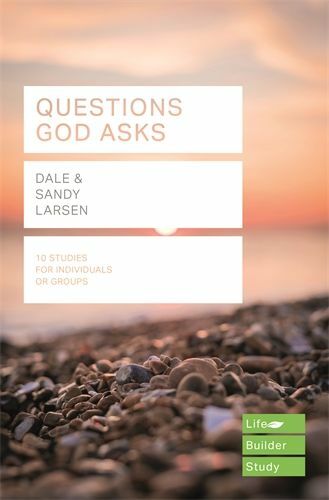 Questions God Asks (Lifebuilder Study Guides) by Dale Larsen; Sandy Larsen was published by SPCK in September 2018 and is our 22168th best seller. The ISBN for Questions God Asks (Lifebuilder Study Guides) is 9781783597024. I was disappointed with this book. I had expected that each of the nine questions would be dealt with much more comprehensively and seek to draw out the spiritual implications for us today etc. Instead there is only a brief 'introduction' and the reader or group members are left with a series of questions to try to tease out. If I had known the format of the book beforehand I would not have bought it. Got a question? No problem! Just click here to ask us about Questions God Asks (Lifebuilder Study Guides).